As long as I can remember, there has always been a vegetable garden at my parent’s. This space, on the north end of the front yard, was a sizeable rectangle that enjoyed all-day sun. 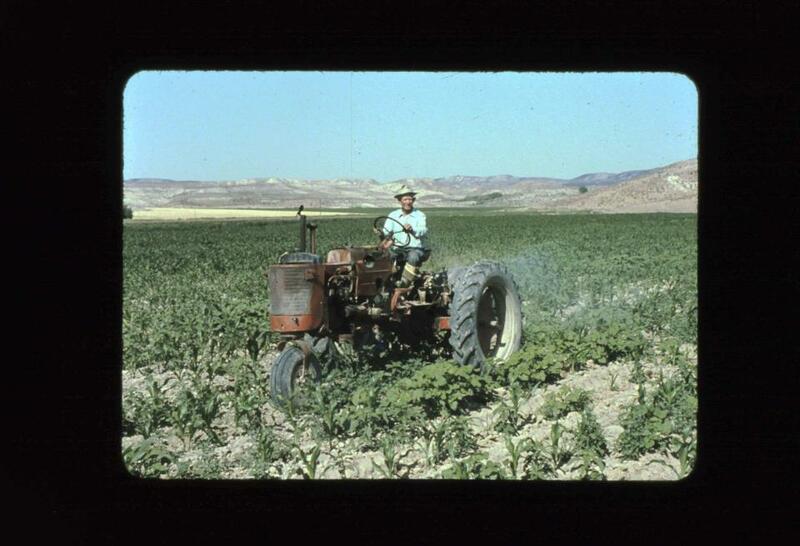 The garden space grew larger when my dad hauled Granddad’s tractor from his eastern Oregon home to ours. Each summer, the same panoply played out: beets, carrots, chard, potatoes, sweet corn, squashes, and green beans. The green beans were a pole-growing variety, and they, towering along with the corn, provided great hiding places, their slightly sticky leaves attaching to my shirt, pant leg, or hair when passing by. While I detested pulling weeds and removing rocks, I enjoyed the garden as a whole. I can still feel the slight resistance, the meager defense of a carrot being pulled from that sandy soil, soil perfect for growing root vegetables. I soaked in the beauty, wonder, and bounty that is a summer vegetable garden. This is also where I learned of a garden’s potential tyranny. Bean Day. This was usually a one-day event in August. We would all descend upon the garden, paper grocery sacks in hand, and start picking the beans. When at least 2 bags were filled, my dad would stay behind picking, while the rest of us found knives, cutting boards, and space at the kitchen table, working around the mountain of just-picked beans in the center. One or two, including my mom who can work freakishly fast, had the job of “tipping” the beans, using a small paring knife to remove both the stem end of the bean, and the pointy end. Mom was insistent that the pointy end be removed. These beans formed a new pile to the side where the cutters could get working. We stacked the trimmed beans like cord wood, cut into 1-inch pieces, then placed them in a large bowl or pot. The trimmers whittled down the center pile just in time for Dad to empty another bag, recreating the mountain we started with. When a few large containers were filled with cut beans, the beans would get a rinse, then find their way into the hot, sterilized pint jars next to the sink. These jars would be topped with some salt, hot water, a canning lid with ring, then placed into the pressure canner. The lid would be fastened, and the heat would be applied. 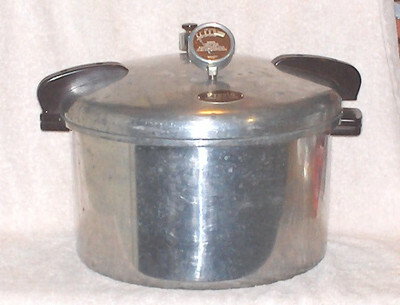 It never seemed to take long before the steam inside the canner began escaping at a wild rate, whereby Mom would place the regulator on to the steam valve and the jiggling would begin. The jiggling regulator needed to move at a steady pace, so Mom watched and listened carefully. We had heard stories of pressure canners exploding, but Mom was vigilant, always respecting these monsters of the stove. We were saving food to eat throughout the winter and spring. Our freezer would hold pie-ready apples, cut-from-cob sweet corn, squares of squash, and the other usual items brought home from the store, so my mom used canning for most other fruits, and green beans. There are few options for preserving foods low in acid. Green beans are one of these foods and can be pickled, frozen, or pressure canned. Pressure canning increases the processing temperature beyond that of boiling, creating an environment inside the jar hostile to harmful bacteria. If the seal of a jar fails or is otherwise compromised, bacteria can take root. Mom taught us to open any jar of beans with care and awareness, listening for a hearty release of the jar’s vacuum. To this day I will only eat home-canned foods prepared by people who I know take careful precaution in the kitchen. While the pressure canners jiggled away on the stove, we continued to pick, tip, and chop, growing increasingly weary, the center pile eroding slowly, my mom trying any means to prod us to the finish. With the last bean chopped, the crisp vegetables sat ready for rinsing, awaiting their turn at processing, until the canners left the stove, and cooled completely before the next batch could begin. We were free to do as we pleased while Mom continued the pack-salt-load-jiggle routine, often pulling the last jars from the final load just before falling into bed, exhausted. For my sisters and I, Bean Day became a dreaded day. As an adult I can completely respect my parents’ relentless effort to provide for their family. A garden offers the highest quality food and home canning makes that food available throughout the coming year. My mother, then and now, has an incredible capacity for work. She tackles projects. When the beans were ready, so was she. I don’t know what my sisters felt, though my older sister has had little love for green beans to this day, but I never felt put upon. My parents weren’t mean, there was just a job to be done, a job that benefited our whole family, so the whole family helped out. These days, we eat the beans as we pick them, most days of the week during the growing season, usually cooked just until tender, pointy ends intact. They are sweet, with a slight resistance to the bite, then soft, not fibrous unless picked too late. If I have excess beans from my garden I blanch, then freeze them. I prefer the flavor and have no wish to offer any sacrifices on the altar of the Presto 01781 23-Quart Pressure Canner. 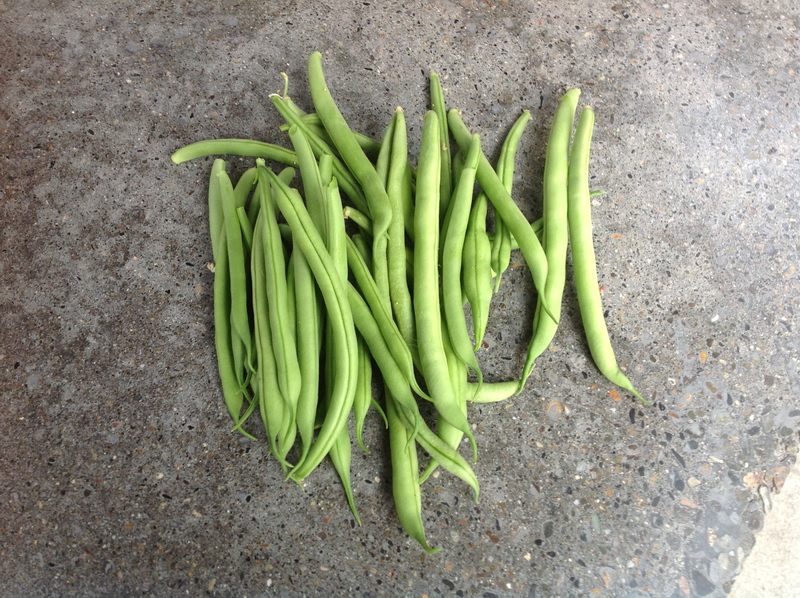 This entry was posted in Gardening and tagged beans, canning, compulsive, garden, sisters. Bookmark the permalink. This took me back. I can remember the hopelessness when the new bag hit the center of the table. All this effort for a vegetable I just didn’t prefer. Beautiful pictures painted with your words. Nice work. Love you. I usually grow beans in my garden, and still use the pressure cooker and can them. Kind of a yearly tradition. Beans are one of the few green vegetables I can get Jeanette to eat! Good! Junior eats green beans as well. We love them from the garden. For 2 years I’ve grown a french filet type called Fortex from Uprising/B’ham. Super good!